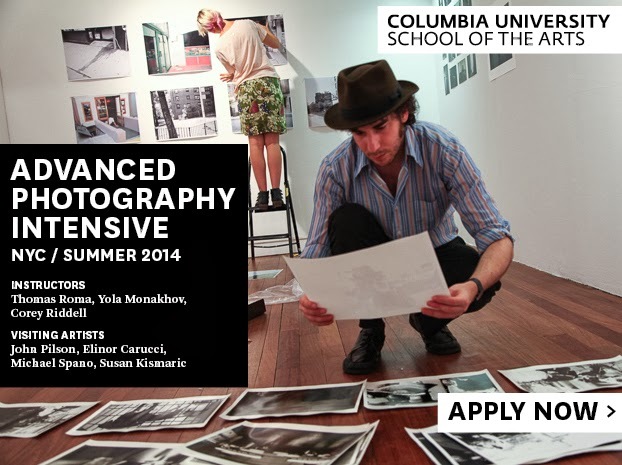 Our partners at Columbia University School of the Arts have announced its Advanced Photography Intensive, which aims to engages students in all elements of photographic practice and the development of a portfolio. A combination of technical tutorials, individual meetings with internationally renowned artists and art professionals (Thomas Roma, John Pilson, Elinor Carucci, Michael Spano, Susan Kismaric and Vince Aletti), as well as a series of seminars and group critiques, provide students with the tools they need to advance professionally and further develop the core elements of their practice. The Advanced Photography Intensive creates an exceptional workshop environment where students have 24-hour access to traditional and digital facilities, coupled with daily hands-on assistance from experienced faculty and staff, culminating in a group exhibition at the LeRoy Neiman Gallery. Students are expected to produce work independently throughout the six-week term and fully dedicate their time and efforts to the course. The course is designed for several distinct types of students: exceptional undergraduates passionate about photography, college graduates preparing to apply for MFA programmes, experienced photographers looking to gain knowledge of the photographic tradition and its advanced techniques, and seasoned artists and teachers wishing to rigorously develop their practice through a critical dialogue with faculty and other students. For more information on the features of the course, and how to gain admission click here. FOAM have announced their annual talent call, which gives entrants the chance to have their work published in the prestigious Foam Magazine and be exhibited in Amsterdam during Unseen Photo Fair. The Foam Talent Call is a springboard into the photography industry, giving young photographers international recognition and acclaim. Previous Foam Talents include Ina Jang, Alex Prager, Jessica Eaton, Shane Lavalette, Sam Falls, Pieter Hugo, and Mayumi Hosokura, as well as 1000 Words featured artists, Taryn Simon, Daniel Gordon, Daisuke Yokota, Melinda Gibson and Esther Teichmann. Entrants must be between 18-35 years old and the entrance fee is 35 euros. 15 selected talents will receive an eight page portfolio showcasing their series along with an interview by an esteemed writer. The competition is open for entries until the 12 March via their website or through their Facebook page. Click here to apply or watch the video preview below for more information.